Smart mapping in ArcGIS Online provides a data-driven approach to symbolizing layers and exploring data. 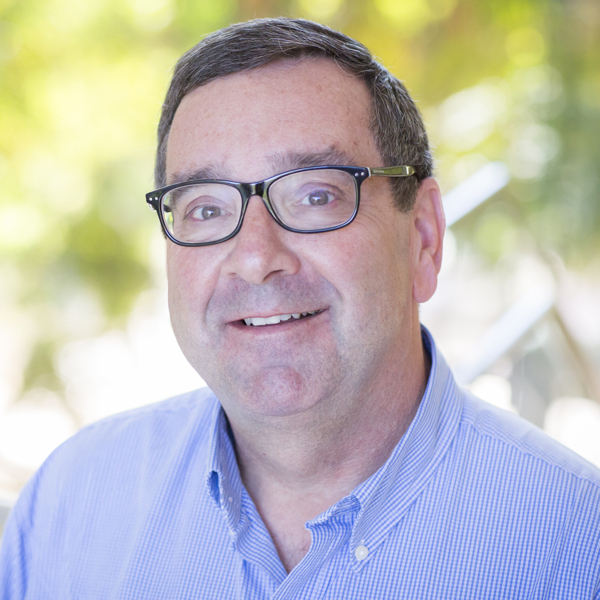 When changing style, the choices you see are determined by the nature of your data. 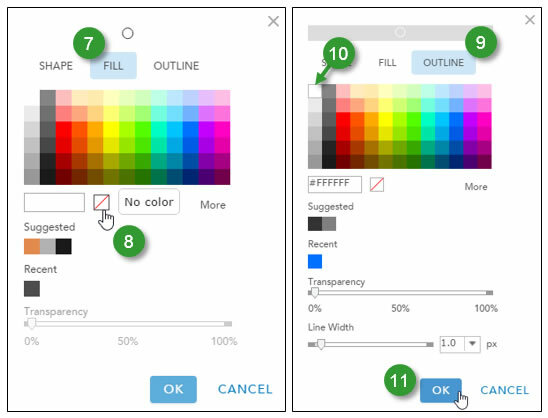 Once you have decided on the initial form of your features—for example, selecting either circles or colors to show population—you can to change their appearance, such as choosing colors, line weights, and transparency. You can create interesting effects by duplicating layers and applying different styles to each layer. In the tip below, you will learn how to create a glowing double ring effect. When you use proportional circle maps, the large circles may cover small circles, so it may be difficult to view the map details beneath them. Using hollow circles, which are outlines with no fill, helps to solve this problem. You can also overlap layers using different colors and transparencies to create a glowing double ring effect, as detailed in this tip. Use the provided sample map, or use your own map with layers having numeric values suitable for the Counts and Amounts (Size) drawing style. The sample map includes the original layer (left) plus the copied layers showing the result (right). Step 1. 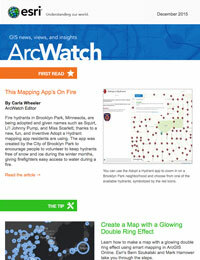 Sign in to your ArcGIS Online account. Open the sample map (or your own map) and create two copies of the layer. Click Contents. 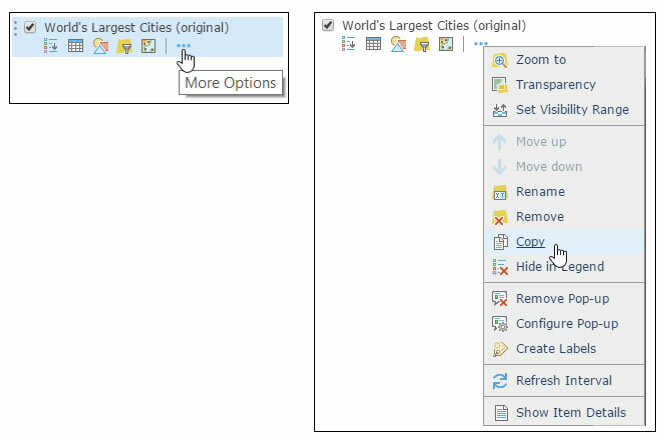 To copy a layer, open the context menu then click More Options and choose Copy. Step 2. Using the first copy of the layer, click Change Style. Step 3. 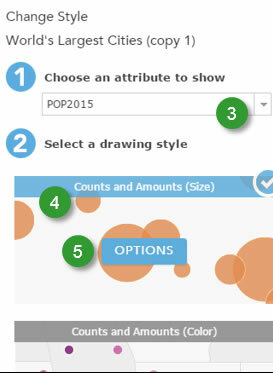 Choose POP2015 from the attribute list. Any numeric field can be used. Step 4. Choose Counts and Amounts (Size) as the drawing style. Step 5. Click OPTIONS to change the style. Step 6. In the Change Style text box, click Symbols to change symbols. Step 7. Click Fill to adjust the symbol’s fill properties. Step 8. Set the fill for No color, making the interior of the shape transparent. Step 9. 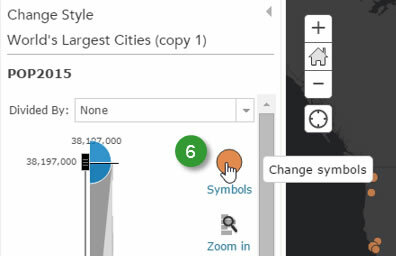 Click OUTLINE to adjust the symbol’s outline properties. Step 10. Choose white for the outline. Adjust the line width to 1 pixel. Step 11. Click OK to save your changes. Click OK and Done in the subsequent panels to accept your changes for the layer. You’re now finished with the first layer. Step 12. Begin a similar process with the second copy of the layer, following steps 1–7 above. Step 13. Choose No color again for the fill. Step 14. 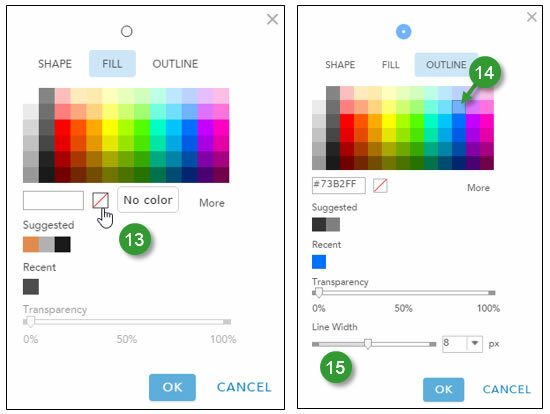 Click OUTLINE and select a color for the outline other than white Try a medium blue, for example, as it offers a nice contrast. Step 15. Adjust the line width to 6 or 8 pixels or so. Click OK. Step 16. Click OK and Done in the subsequent panels to accept your changes for the layer. You’ve now completed symbol changes for the second layer. Experiment with additional layers and different widths, colors, and transparency settings to achieve the desired effect.